CLOTH & KIND'S INSPIRATION // We chose Detroit, MI as the inspiration for our window because it’s near and dear to Krista’s hometown of Ann Arbor, MI, it’s currently experiencing a resurgence of gigantic proportions, especially amongst makers and creatives, and because we always root for the underdog. In a nod to a past resurgence that Detroit experienced during the post-WWII era, we created an Art Deco Detroit inspired space that seamlessly blends eclectic style with traditional craft motifs and Machine Age materials that were prevalent at the time. Art Deco is characterized by rich colors, bold geometric shapes and lavish ornamentation, which we’ve included in the sultry deep plum tones used throughout, the triangular Tania wallpaper from Paper Mills and gilded rose gold adornment throughout, such as is seen wrapping the custom Bruce console tables with clipped corners from Bradley. We loved working with some of our favorite creative forces of nature in bringing this vision to life, and owe them each special thanks, including: Paper Mills, Bradley, Moattar, Lisa Ellis through Holland & Company, R Hughes, Clay McLaurin, Tritter Feefer, Martin Nash and Ernest Gaspard. 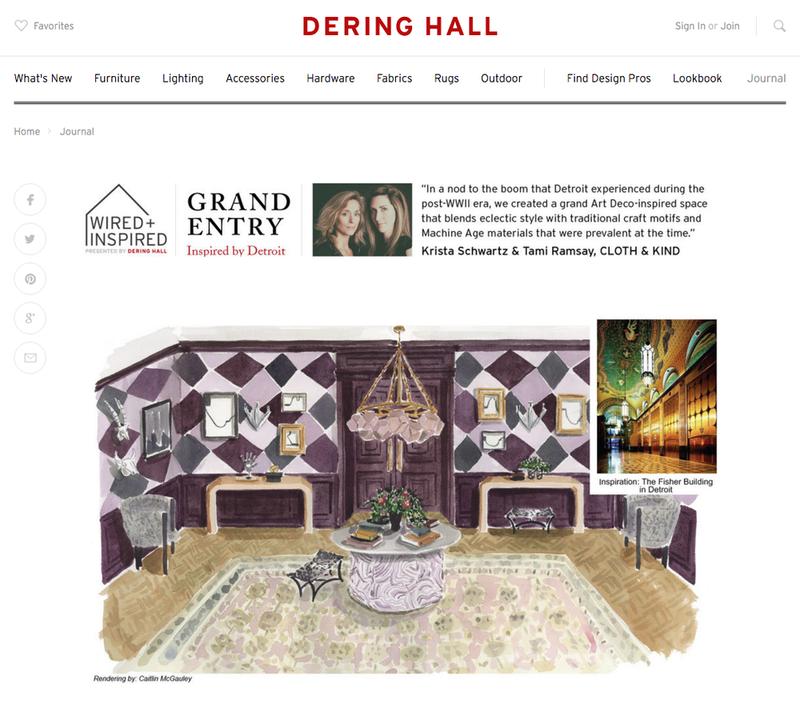 Also, extra smooches to Caitlin McGauley for her gorgeous hand rendering of our space for Dering Hall's Virtual Showhouse.